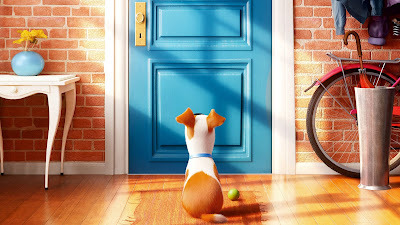 The fifth feature film from Illumination Entertainment and Universal Pictures comes to the world in the form of The Secret Life of Pets. With about a fifty percent success rate, Illumination looks to venture out of the Despicable Me world into the realm of talking animals. The approach, not unlike their other films, aims at the younger aged demographic whole-heartedly rather than leave some clever moments for the adults like other animation studios. The attempt is valiant by the young animation studio, but does the film reach it's potential for greatness? Max (Louis C.K.) is a spoiled terrier that enjoys a comfortable life in a New York building until his owner adopts Duke (Eric Stonestreet), a giant and unruly canine. During their walk outside, they encounter a group of ferocious alley cats and wind up in a truck that's bound for the pound. Luckily, a rebellious rabbit named Snowball (Kevin Hart) swoops in to save the doggy duo from captivity. In exchange, Snowball demands that Max and Duke join his gang of abandoned pets on a mission against the humans who've done them wrong. The entire premise of a film titled The Secret Life of Pets is sort of expected to follow this idea, and yet it doesn’t deliver upon this promise. The first ten minutes, albeit almost exactly like the trailer, take the secrets of pets and runs with it. But the film eventually must have a plot to advance the story and justify a full-length feature. This eventual plot becomes highly predictable and oddly familiar to a little film from 1995 named Toy Story. 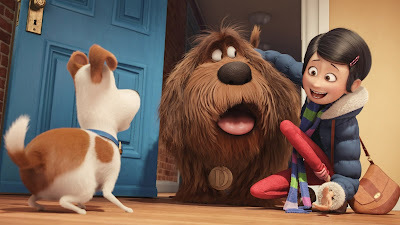 The set-up and progression of the story happen in such a similar fashion, but The Secret Life of Pets tries to get away with it by playing with the love for pets out there, and it works. Unfortunately, the film falls victim to character overload with unmemorable side characters. The main pets, Max and Duke voiced by Louis C.K. and Eric Stonestreet respectively, are enjoyable and have enough character to justify following them on this journey. But the rest of the characters feel unneeded and widely similar across the board, with the exception of Snowball the bunny voiced by Kevin Hart. Though the fear was there going in, the character was completely a bunny version of Kevin Hart, and not the good standup Kevin Hart but more of the Ride Along Kevin Hart (Translation: Not a GOOD remark). Snowball is widely annoying throughout the entire film and ruins some decent comedic moments with his own terrible moments. The animation is pretty solid, having it’s own style and design without being typical for animals in a city. There are details on some of the pets that are pretty incredible without becoming too realistic. But amongst the wonderful animation is kid-based humor, with physical comedy being a large part of it all. 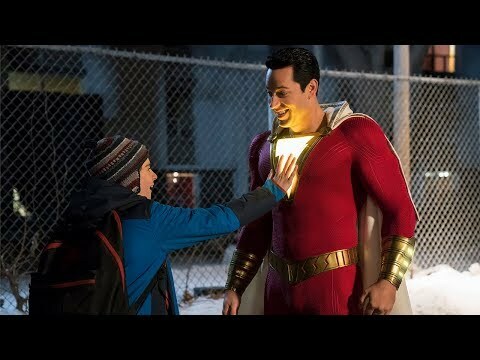 It certainly takes aim at the kids without leaving room for enjoyment by all of the family, which is okay but knowing it doesn’t have Pixar’s level of emotion and charm is something to note when entering the theater. So what did you think of The Secret Life of Pets? Have you seen it and how much better are dogs than cats? Share, subscribe, comment below and as always return to I Am Sam for weekly reviews and insight.